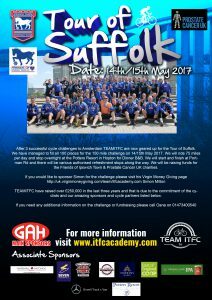 After 3 successful cycle challenges to Amsterdam TEAMITFC are now geared up for the Tour of Suffolk. We have 100 places available for cyclists of all levels and abilities who would like to join us for the 150 mile challenge on Sunday 14th – Monday 15th May 2017. 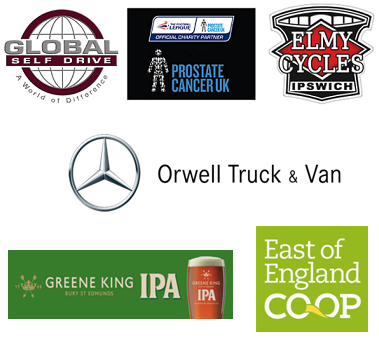 We will start and finish at Portman Rd and there will be various authorised refreshments stops along the way. SPECIAL THANKS to our Main Sponsor – John Reader at GAH and to our Associate Sponsors Warwick Dunnett (Seven Telematics), James Robbins (Marshall Hatchick), Iain Jamie (Hopkins Homes), Andy Sallnow (Prostate Cancer UK), Steve Grimwood (Elmy Cycles), Darren Reeves (Global Self Drive), Oliver Jackson (Greene King) and The East of England Co-operative Society. TEAMITFC have raised over £250,000 in the last three years so if you would like to join Simon Milton & Terry Butcher and the team on the challenge and help us raise funds for 2 excellent charities please show your interest using the details below. 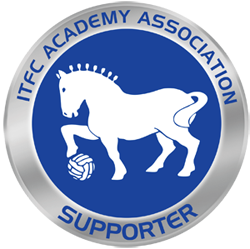 Please use teamitfc@itfc.co.uk to register your interest. 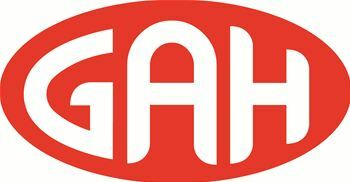 Alternatively please call 01473400540 if you need any additional information.